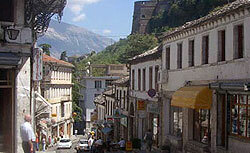 Gjirokaster, which borders Greece, is home to one of the largest Greek communities in Albania. The county is steeped in history, and the capital, Gjirokaster (Gjirokastra) is one of the most visited cultural centres in the country. Other districts in the county are Permet and Tepelene. Gjirokastra City is a melting pot of Albanian, Byzantine, and Ottoman architectural traditions, set against the majestic backdrop of the snow-capped Gjere mountains and the Drino River. This is an ancient city, set in the historical Epirus region on the steep side of the Drino valley. Its well-preserved Ottoman old town is on the UNESCO World Heritage List. Overlooking the city is the grand castle of Kalaja e Gjirokastres, a sentinel to Albania's colourful medieval history. Today the castle houses a military museum full of memorabilia and captured artillery from the Communist resistance. Gjirokastra has had a long history. It began as a feudal stronghold, then became Ottoman, then came under Italian rule. By virtue of being a living museum, Gjirokastra was spared the horrors of redevelopment during the Communist regime. These days it is considered an important gateway into the country's past, and the National Albanian Folk Festival is held here every four years. A certain grandeur permeates the old town, which is very rewarding to those who choose to discover it. Gjirokastra's melange of cultural influences bends harmoniously. Some buildings, however, have been subjected to years of neglect, although these problems are slowly being resolved. The city has preserved the old bazaar originally built in the 17th century, and rebuilt after a fire in the 19th century. Some extraordinary houses earn Gjirokastra the moniker "City of Stone" - 200 tower houses in the Ottoman style, with distinctive stone roofs, wooden balconies and whitewashed stone walls. Some of these homes have been converted into boutique hotels.